We started our morning at the Portobello Road Market in Notting Hill. It’s basically a street-long flea market. There are antique shops, souvenir booths, clothing/scarves/purses, and food stands (we had a delicious ham and cheese crepe for breakfast). It’s a fun stop and I found some great items to bring home. 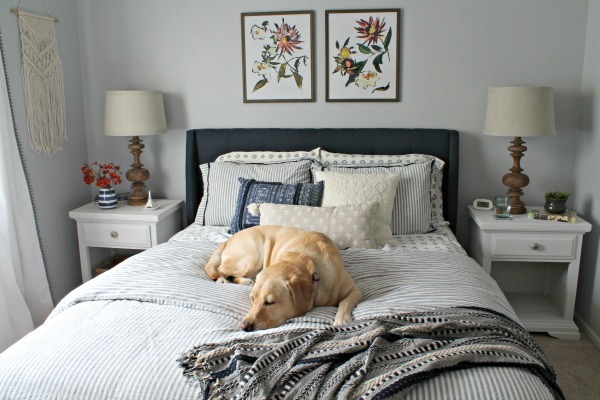 I already showed you one of the prints that I bought, but I also bought a hand-carved crown stamp and a brass lion-head door knocker - fun items that will always remind me of London! We had made it the whole week in London without any rain, but our luck finally ended and we got rained on at the market. It wasn’t coming down very hard, just enough to make my hair frizzy! We finished up at the market after a couple hours and left Notting Hill and headed to the London Eye. We lucked out and it wasn’t raining on that side of the city, so we were able to ride the London Eye with clear skies. In fact, the rain stopped for the rest of the day. We ended up buying the quick passes for the London Eye because we were feeling impatient. We boarded pretty quickly, so it was definitely worth the extra money. 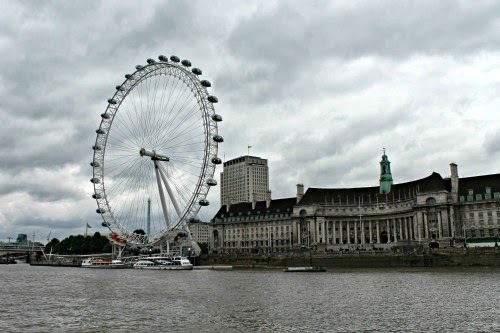 Although, in general, I think the London Eye is pretty pricey. Anyway, the view from the London Eye is amazing. 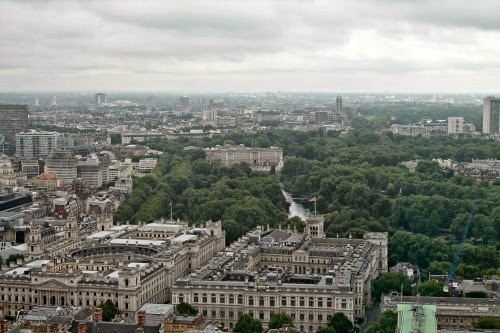 You can see St. Paul’s Cathedral, Buckingham Palace, and of course, the Palace of Westminster/Big Ben and Westminster Abbey. I think this is my favorite picture from the whole trip. 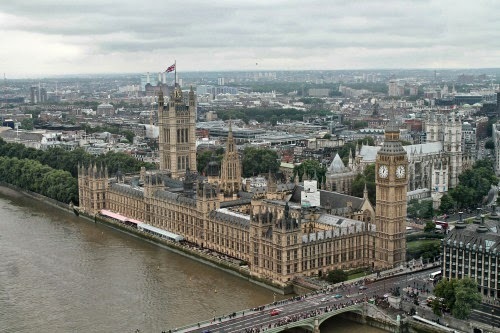 Once we got off the London Eye, we walked down the river a bit to get one last look at the Palace of Westminster/Big Ben and take a few pictures with this amazing backdrop. Finally it was time for lunch – we stopped at All Bar One near the London Eye. It took a while to get our food, but it was worth it! I ordered the steak sandwich and it was one of the best I’ve ever ate! I think it was the onion chutney that made it so delicious. After lunch we took the tube to the St. John’s Wood station to see Abbey Road. I’m not a huge Beatles fan, but I think Abbey Road is a must while in London. 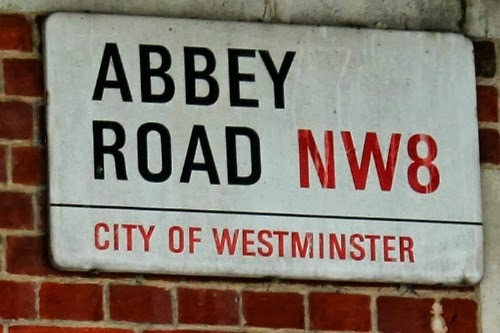 Although, no one ever mentions that Abbey Road is actually a really busy road. You had to dodge traffic to make it across the street and get your picture taken, which is why this picture is kind of blurry. We ended our night (and our trip) at the Tower of London to witness the Ceremony of the Keys. 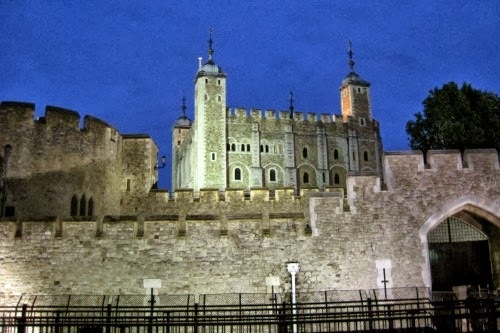 The Ceremony of the Keys is the locking up of the Tower of London and has taken place every night for over 700 years. Tickets are free, but you have to send (by mail) a written request to get tickets. They only allow a small group (about 40 people) entry, so you have to request tickets 2-3 months ahead of time. I would highly recommend getting tickets because it’s very interesting. Just being in the Tower of London at night, with only a small group of people, is pretty awesome. We ended up being the first people through the gates, so we had a great spot to watch from. And with that, our time in London was over! We had an amazing trip – truly the trip of a lifetime! 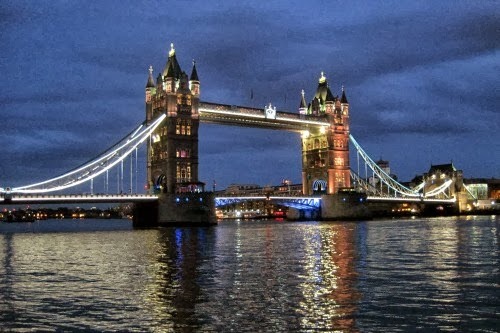 Love the night shot of London Bridge. 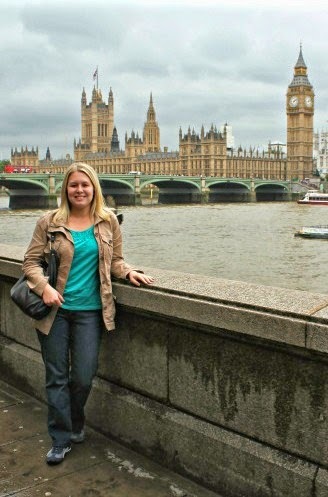 So pretty and I also like the pic of you with Big Ben and Parliament in the background.That was a great idea for a picture. We enjoyed the London Eye very much also. I thought I would feel a little scared but wasn't at all. It was a thrilling experience. I am glad you were able to buy some things at Portobello Road. I had heard so much about it and would you believe we came in on the food court side and that took so long all our time and my husband's patience was gone. Maybe someday I will get to go back. 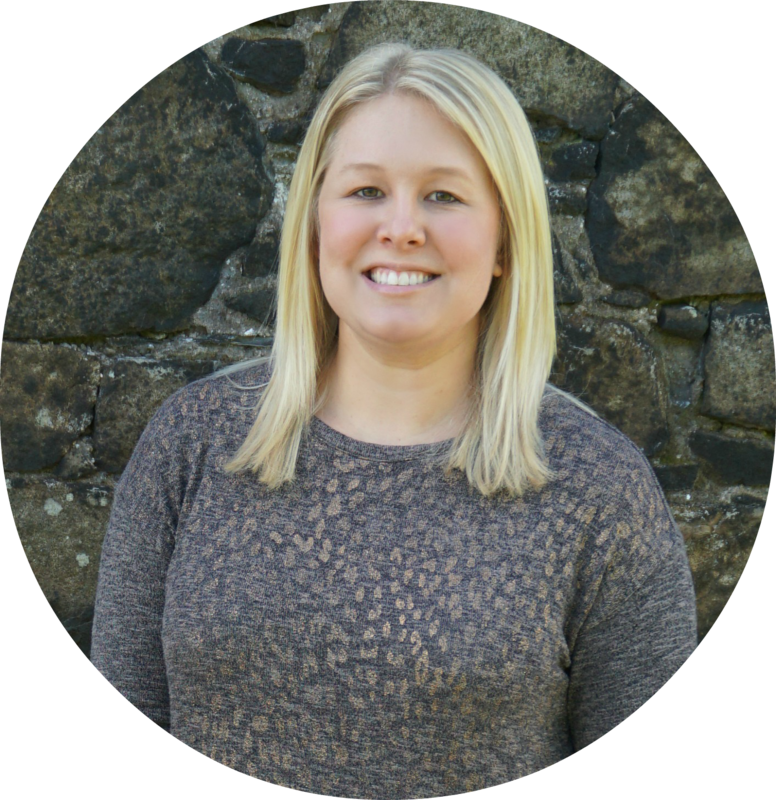 It is fun to see another persons perspective on a city you have visited too. I can't wait to go back to London some day. I had never heard of the Ceremony of the Keys, but it sounds interesting, so thanks for the tip of requesting tickets months ahead of time. 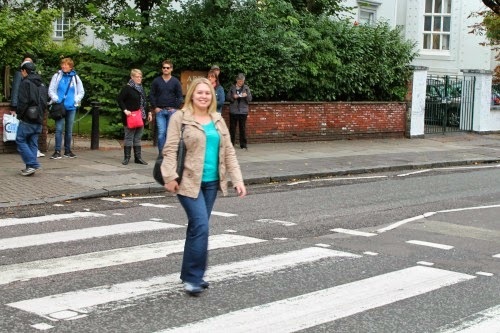 I think I would want to cross Abbey Road as well. I wonder if it completely bugs the motorists that people are taking pictures in the middle of the street. I'm sure it does bug them! Most of them would stop for the tourists, but if they didn't move quickly they'd start honking. Absolutely beautiful shots of London. Oh my what a nice trip! Going to London is on my bucket list! 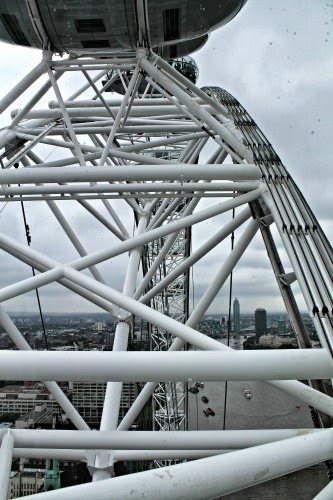 I could never go up on the London Eye but the views are amazing. I would have loved going in to witness the Ceremony of the Keys too. Thanks for the tip about writing ahead of time for tickets. My mom was nervous about getting on the London Eye too, but she ended up loving it! 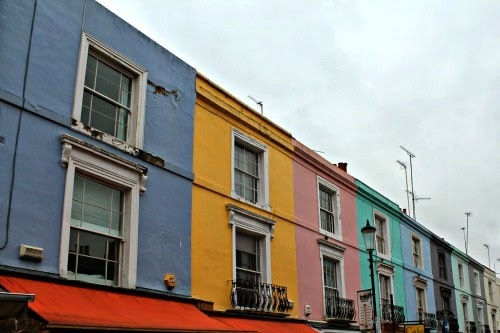 When we went to Portobello Road it was kind of iffy weather and not much was out. I was very disappointed, especially now that I've seen Alma's pictures. I never knew that you could do the ceremony at the Tower; that will be on my bucket list for my next trip! That's such a bummer! It was sprinkling while we were there, but no one seemed to mind...they are probably used to it! Definitely get tickets for the Ceremony of the Keys if you can! We loved it! 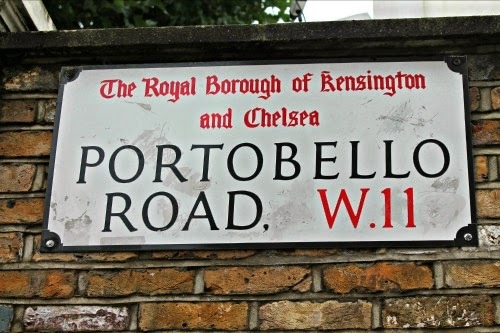 So funny that we're both featuring Portobello Road in the same week! Thanks so much for sharing it with us at "Oh, the PLACES I've been!"